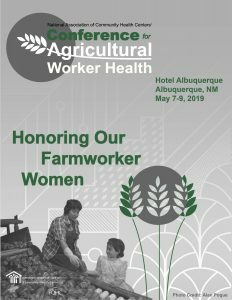 The Conference for Agricultural Worker Health is the only conference dedicated solely to the health and well-being of America’s migratory and seasonal agricultural workers and their families. The National Association of Community Health Centers (NACHC) sponsors this conference each year to bring together leaders in migrant health to learn from each other to improve the health and well-being of this population. Community and Migrant Heath Centers (C/MHCs) serve one million migratory and seasonal agricultural workers. This represents approximately 22% of the estimated number who reside in the country. Clearly, much work is left of be done to increase the reach to this population. Three years ago, NACHC’s Committee for AG Worker Health launched the AG Worker Access 2020 Campaign and established a 12-member Task Force to develop more effective outreach efforts, identify new models and strategies, provided training and technical assistance all designed to better reach this population. Since, we have served over 100,000 new farmworker families. While this is a modest increase, given the current political climate facing this population and other immigrant communities, some challenges and barriers persist that contributed to this modest increase. However, in spite of these challenges, our collective efforts helped reach new farmworker families. Since the inception of the campaign, we have learned that we cannot be as effective by simply working within the health center world alone. Rather, we must work closely with other like-minded organizations at the local, state and national level. The Task Force has been re-configured to broaden the membership of the Task Force beyond community health centers. The Task Force now includes representatives from entities such as farmworker housing projects; migrant and seasonal head start grantees; faith based organizations; migrant education, to name a few. We know the campaign is working, but we must do better, we can and we are. We are proud of the 2019 Conference theme “Honoring Our Farmworker Women” to recognize the contributions of women in migratory and seasonal agricultural work since the Migrant Health Act was passed in 1962. In recognition of farmworker women and those who have dedicated their career to serving this population, the Honorable Dolores Huerta will join us to provide the keynote and highlight the contribution of women in supporting agriculture work. For those who are new to the field of migrant health we will look back at the history and growth of the migrant health program with distinguished speakers who will reflect on evolution of the program. By becoming familiar with our roots and history, we can better serve our communities and prepare future generations of migrant health center leaders. Come and join us in the Land of Enchantment in beautiful Albuquerque, New Mexico. The conference will afford you the opportunity to connect with your peers, learn about effective strategies, tools and models that have proven to better serve our country’s agricultural workers and their families. This knowledge can make a difference in your organization and improve your own effectiveness as a leader.